This is a working calendar, we’re always adding new events as we find them! 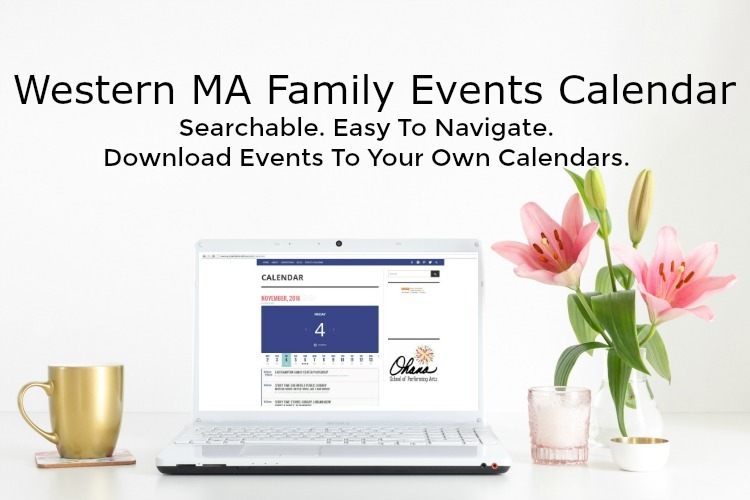 If your business or organization has an event that families in Western MA are interested in, head here to find our submit an event submission form. It’s free! If you are looking to connect with parents in Western MA, we’d love for you to join our community on Facebook! There are two calendars on this page. The first is a daily view, which is perfect for people who love to plan their schedules day by day. The second is a full month calendar listing. To use this calendar, click on the date you’re looking for something fun to do. You’ll find a list of things to do and you can click again on the event’s heading to find details! You can use the arrows to the left or right of the date to load the new day’s events. If you want a calendar you can filter/search scroll past this calendar to the full month calendar below. This calendar lays out out all of the events by month. Click on the event to reveal more information, including Google Maps, links to the event and more. Use the filter function to see just what you’re looking for either by town or event type!